The Art Guild of Tellico Village, Loudon, TN meets each month from September through May. Meetings are held the third Thursday of each month at the Tellico Village Yacht Club on the top floor. Social hour begins at 9:30 am with the meeting beginning at 10:00 am. After a short business meeting, a one hour program is presented by local and regional artists. See the photo gallery under the "More" tab to see pictures taken at the monthly meetings. Contact Kate McCullough with questions: kateswaterart@gmail.com, 865-604-1406. Speaker: Elle Colquitt Link to Elle's work. Program: Photography is a powerful story telling tool. But it is more than just taking a picture. -A Snapshot- It's about finding and taking the pictures that gives your unique perspective on the subject. There is more to a city than just walking the streets capturing candid moments. Each city has its own heart and soul, different from any other place. As a street photographer, my passion is in capturing the energy and randomness of people on the street as well as the city’s aesthetics and design unique to its culture. My images visually tell the Story of a City and celebrates how the mundane can be visually refreshing. Street photography is a moment in time capture – a visual documentary on life and culture. Elle Colquitt’s journey as an artist has taken her through many phases in her life ... writing books … designing textile art… painting… and looking at the world through the eye of her camera lens. Her camera accompanies her on hiking and cycling adventures, where she captures the beauty of the natural world. Currently, she has widened her aperture to appreciate the aesthetic of the urban landscape and to sharing stories of the city where she resides and those she visits. As a street photographer, Elle uses her camera to capture unique candid moments and odd juxtapositions that are abundant in city life. As an author and instructor, Elle shares her creative perspective and inspirational ideas through photo walks and seminars. She encourages others through her photography to look for patterns, colors, shadows, and textures that will help make a more interesting story. She is currently a member of The Arts and Culture Alliance of Knoxville. She has several First Friday showings scheduled for 2019 at various downtown locations. Program: Lisa is a local artist helping other artists. She will present the importance of archiving and present ideas for developing a successful art business. The Print Studio at Fuller's was founded by local artist, Lisa Bell. Her passion for art and love for people drove her to create a place where she could help other artists grow their businesses and make their dreams realities. Since it's birth in 2012, The Print Studio at Fuller's has grown and expanded their services to include sublimation, fabric printing, and high resolution scanning. Lisa and her crew work hard so that artists have options for their business and limitless possibilities for their creations. Even after seven years, Lisa still runs her business on the core values she began it with: quality, exceptional customer service, and products created by artists for artists. Lisa's passion for art and her faith walk hand in hand in her pieces. Her captivating sunrises are meant to reflect the faithfulness of God and His everlasting promises. Psalms 65:8 "The whole earth is filled with awe at your wonders; where morning dawns, where evening fades, you call forth songs of joy." Lisa and her husband Mike have been married for 34 years, and together they have 5 wonderful children. Lisa's dedication to her family is a cornerstone of her life and the love she freely gives is evident in the power and the emotion of her art. Lisa has always had a deep love and calling to the arts, but it wasn't until 2006 that she fully gave herself to the occupation of being an artist full time. Since then, she has received awards in local art shows, and used her work as a ministry through organizations like Women at the Well. Lisa now owns a successful printing business called The Print Studio at Fuller's where she works to give other local artists premium fine art prints. Also at our April 18 Meeting Scott Manning of Jerry’s Artarama - Always a valued and informative guest, Scott Manning will join Lisa Bell’s presentation to provide additional information about products and services that can enhance the archiving process. Speaker: Mary Saylor, Link to Mary's work. Program: Knoxville artist Mary Saylor will give us a lively and upbeat presentation about the paper mache animal sculptures she creates. She will also provide examples of her work in different stages to show the progression of how her unique and colorful pieces are developed. Taylor was born in eastern Kentucky but raised in Columbus, OH. She moved to Knoxville in 2011. She obtained a Bachelor of Fine Arts degree from Ohio University with a minor in Sculpture. In addition to being a homemaker, mother and full-time health professional, she has worked creatively in drawing, painting, wood carving, clay sculpting and quilting. Recently, most of Saylor’s work has been fashioned from paper mâché and mixed media using recycled materials. She has a whimsical bent and a deep love and appreciation for all animals, especially dogs and cats. “I never know how each new sculpture may evolve as I begin,” she says. “They always surprise me as they come to life with their own personalities and stories!” To see the delightful gallery of Saylor’s unique sculptures, go to thecraftydonkey.com. Speaker: Hugh Bailey Link to Hugh's work. Program: Sculptor and potter Hugh Bailey will speak at our January meeting and show us how he creates his three-dimensional figures of animals. With more than 50 years experience working in numerous media, Bailey now focuses primarily on the charming and whimsical sculptures for which he is widely known, say that he just works doing what he feels. Bailey received a BA in Fine Arts from Berea College in Kentucky and a Master of Fine Arts from Indiana University. He has taught many extension courses for the University of Virginia at Bristol and worked as a graphic designer for the University of Tennessee from 1960 until 2001. He is a member of the Southern Highlands Handicraft Guild, Foothills Craft Guild, the Knoxville Watercolor Society, the Art Market Gallery and the Appalachian Arts and Crafts Center. Bailey was also recently honored with the Founder’s Award for Artsclamation 2018 in recognition of his long time participation and commitment to that event. 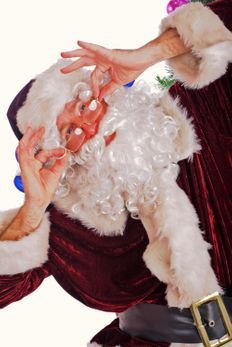 Program: As part of the festivities, we will have a White Elephant exchange (or Dirty Santa). Bring something you already have or purchase something if you prefer. Please email Pat Kurowski at patricia.a.kurowski@gmail.com to sign up and select your menu option for the luncheon. Then mail your check for $15, made out to AGTV, to Pat at 140 Oostanali Way, Loudon, 37774. Menu choices are : Vegetable Quesadilla; Grilled Catfish with Sweet Potato Fries and Coleslaw; or Strawberry Chicken Salad. Program: AGTV Member's Art "Show and Tell"
Speakers: AGTV Members. Bring in art that you have been working on and tell us about it. If you want to show photo's of your process or work, you will need to bring in a computer that has a HDMI receptacle or an adapter cord. Contact: If you are interested in participating please contact Kate McCullough, kateswaterart@gmail.com or 865-604-1406 with questions. Local artist, Jeanne Dole, recently taught watercolor aboard Cunard's Queen Victoria--her presentation will give insights on this experience. For two weeks, her classes on the cruise ship created paintings inspired by Mediterranean ports-of-call in Portugal, Spain, Italy, and Corsica. At home, Jeanne's watercolor subjects often come from world travel where she connects with the drama and beauty of nature and quaint architecture. She is a member of the Tennessee Watercolor Society, the Knoxville Watercolor Society, and the Fountain City Art Guild. She exhibits her paintings in regional shows. Examples of her work appear on http://artistsites.org/jeannedole/. Terry is a native Tennessean, born in Knoxville. Growing up on a farm and backpacking in the mountains; Terry developed his love for the land and its beauty. He has painted professionally for over 30 years and works to put his personal feelings of nature on his canvass. Terry has a broad following state wide, nationally and internationally; letting his brush tell the story of Tennessee. You can google Terry’s work for more information. He is represented by more than one gallery. Watch for postings this fall when meetings resume on September 20, 2018. Members and guests love this opportunity to learn about new art products, see demonstrations, get free samples and a coupon from the best art store in Knoxville, TN. Go to yourartsupplies.com to learn about their store and art classes. Description: What is style? How do you develop one? When is yours successfully attained? How do you make it Original? With the aid of a few willing Apples and some other unsuspecting paintings, Kate Aubrey will explore, originality, creative thought, and the development your own style. Visit Kate's website for more information. Topic: "Photographing the Solar Eclipse; Eye-dentification"
Topic: “From Nerd to Artist"
louisegallerystudio.com; Julie Boisseau-Craig: Creates jewelry from clay, glass and beads. (Photo at left is from Louise Ragle's collection). AGTV members will be treated to a jewelry panel presentation given by our very own talented AGTV members Pat England, Louise Ragle, and Julie Boisseau-Craig. Their presentation will feature wire, bead, semiprecious stones and clay bead creations! We have had many requests from our members for a jewelry presentation over the years, so come on out to see and here how they create their art pieces. Topic: "Where is Bobbie Crews Now"
Bobbie Crews is a favorite local Knoxville, TN artist and she will be back to Tellico Village to bring us another insightful presentation about her art works. Also Bobbie plans a three-day workshop in October 2017. Find out more about the artist and view her enormous portfolio of work on her website. Topic: "Experiences in Plein Air"
Presentation Title: "A Brief History of Glass and Ideas About Fused Glass"
"In the Digital Age, Is Art Dying?" meeting on November 17. Perry is a prize-winning photographer, author of 28 books and a popular speaker at conventions around the country. He enjoys exploring the challenging questions that face artists in all media today. With rapidly changing technology, what lies down the road and how will it affect our work? In the digital age, is art dying? columnist whose column was carried in 90 newspapers, an expert on international communications who has testified before Congress and a businessman with interests in the United States and the Far East. your questions for Larry Perry and join the discussion on subjects that are sure to interest artists today and tomorrow. to flora, jazz, sport, angel, and landscape themes, her preference remains for wildlife subjects. Tina features overlapping wildlife subjects (e.g., lions, peacocks, tigers, eagles, zebras, wolves, flowers, etc) creating the illusion of stained glass, on her vivid mixed media canvases. Tina also creates and sells reproductions of her art in the form of prints, greeting cards, jewelry, and wearable art t-shirts, dresses and skirts! Her products are sold at The Red Door Galleries in Historic Downtown Loudon, where she also gives BREWnetti painting classes. "Painting Ideas..... Theories that Make Exciting Paintings"
Paul says, "In my workshops I try to give students the basis for making decisions in their paintings. A successful painting is created by navigating through hundreds of decisions during the painting process. Throughout the long history of painting, artists have contributed many ideas to help in this challenge. Our job is not to reinvent the wheel. Why not explore the ideas and theories put forth by many of the great artists of the past and present? Artists have always been great borrowers! Each of us will put our own unique spin on these ideas, filtering them through our own personalities and experiences. Too much emphasis is often given to the 'how to's' of painting at the expense of the 'why's', the theories that form the foundation of our paintings." Visit Paul's website for further information about his work. You’ve spent hours creating your works of art; now you face the challenge of decisions related to presenting it in the most favorable light. 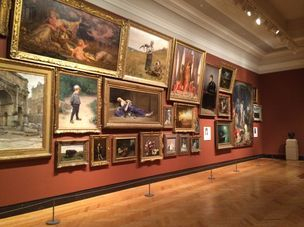 Clinard and Sabo, both AGTV members and award-winning artists, will present the practical aspects of preparing your artwork for exhibit and/or sale. Then Mary Bright will approach the topic from the perspective of a gallery owner. She will discuss framing and other considerations for enhancing the attractiveness of your artwork to potential buyers. Jeremy Doss (b. 1976) grew up in north Alabama. Spending time in nature gave him a heart to paint the beauty of the outdoors... but that is not where his talent stops. He also has a passion for painting figures and still life as well. He paints in oils with a mixture of impressionism and realism. He is mostly self-taught and prefers the alla prima style of painting. In a word he is diverse as an artist. Seth Harverkamp is an oil painter who focuses on drawing, figures, still life and portraits. He obtained his BA in Painting at Carson-Newman College and has studied with several renowned artists. His most recent recognition was as a 2015 International Portrait Competition finalist. Holiday Luncheon and Party, 11:00 a.m. at Classico's Italian Restaurant, 318 Lakeside Plaza, Loudon, TN 37774. $15/person. Reservations required. Bring a wrapped, unmarked "gift" for the White Elephant Gift Exchange. Barry Spruce, Photographer presents "Nature Photography:The Art of a Good Photo." See his Web site at www.barrysprucephotography.com. Docent-led tour of the Knoxville Museum of Art, 1050 Worlds Fair Park Drive, Knoxville, TN 37916. Meet to form carpools at 9:15 a.m. at the Lakeside Realty parking lot, 100 Chota Center in Tellico Village across from the Marathon station. If you are driving directly to the museum, meet there at 10:15 a.m. Tour begins at 10:30 a.m.
See their Web site at www.knoxart.org. site at www.kateaubrey.com for a preview. For more information, contact Cindy Vermeersch.